AT Kid is Responsive Joomla template that targets for kid stores, kid’s centers, summer camps and a variety of children organizations will benefit from these professional design. This template designed to bring joyful enough to attract children, it also to look professional enough to convince their parents that your stores/centers are trustworthy. Because kid stores Joomla template is absolutely perfect to impress parents and show how you care about their children. Vibrant colors, metro style, sliders with full-width images, emphasis on typography – these and much more visual tricks of these templates will turn your websites into modern and engaging. With this reason users will want to stay on your page and browse for more. Make your sites display on both mobile and tablet with 100% responsive layout. Moreover, it builds on powerful framework with completely Bootstrap CSS Framework, Support Font Awesome, K2 extended style and integrated with J2Store, 4 color styles and boxed layout helping to create flawless websites with various layouts. Run the best online campaign with Kid Store Joomla Template and convince people to join you! AT Kid is simple, clean looking template designed mainly for new business websites. It’s easy to custom and edit content via convenient template parameters. AT Kid builds with fully responsive layout based on Bootstrap CSS. It has special built-in design optimized for modern mobile devices iPhone, Android and Windows Mobile-based. 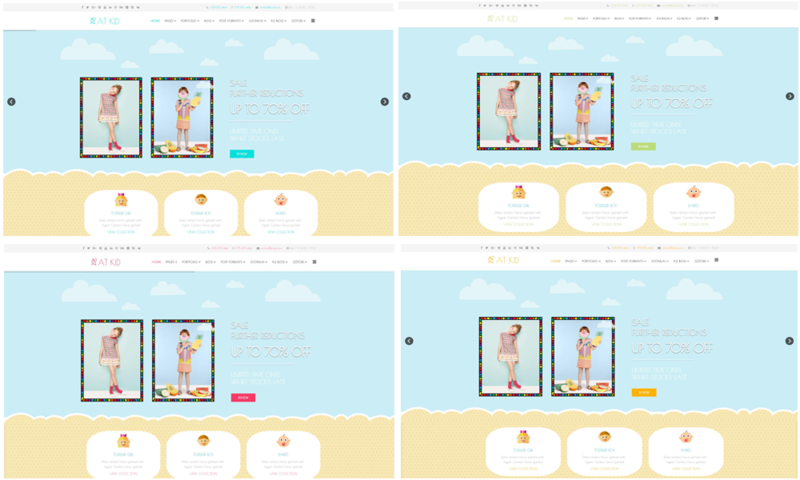 AT Kid supports 4 color styles helping to create gorgeous websites with various layouts. Besides, the template comes with flexible homepage which includes boxed and full width layout. You can see demo via Template Site Tool on demo site. It’s also easy to extend color styles.